Jr. Technical Assistant and 22 posts for Accounts Assistants. Interested/ Willing candidates who meet the eligible criteria can download the application from district website of Sriganganagar. Candidates must hold Diploma/ B.E/ B. Tech Degree in Civil/ Agricultural Engineering qualifications for Junior Technical Assistants posts. For Accounts Assistants jobs candidates must hold B.Com/ C.A Intermediate (IPC/ ICWA). Candidates age should be between 21 to 35 years as on 01-01-2017. Relaxations in age applicable as per Sriganganagar Dist Organization Norms. Complete details of Qualifications, Age criteria, Application Procedure details of Sriganganagar District Recruitment are mentioned below. 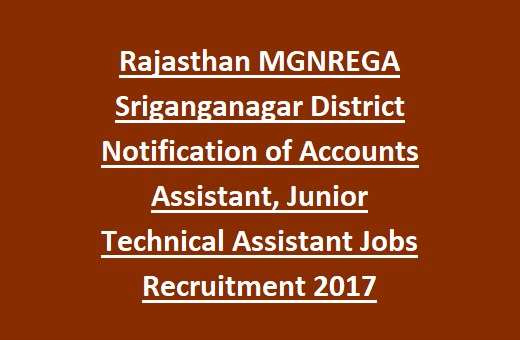 Government of Rajasthan has issued notification for appointing candidates for Jr. Technical/ Accounts Assistant jobs. Sri Ganganagar district employment recruitment starts from 01/August/2017. Eligible Job Seekers may get the application from Sri Ganganagar District official website www.Sriganganagar.rajasthan.gov.in. Open the link and download the respective application form. Read the instructions first. Fill the mandatory details of Application form. Recheck the filled application, once the process is completed. After cross section of application form, attach the documents which are necessary and signature, Photographs. Last date for sending applications to the Collector Office and District Programme Coordinator, Sriganganagar is 30-August-2017. Please check the notification for application fee related information. 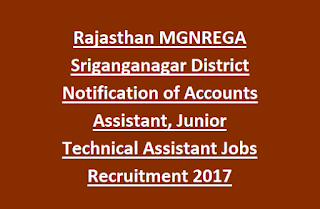 More details regarding Sriganganagar District Recruitment Accounts Assistant, Junior Technical Assistant Vacancy details, Application Fee, How to Apply please go through notification given below. Aspirants who are willing to apply for Rajasthan Government jobs, this is the great opportunity to apply. Eligible applicants refer the notification for details about Sri Ganganagar District jobs. Sriganganagar District recruitment jobs selection is depends on written test/ Interview/ Skill test. The pay Salary will be offered for Accounts Assistant jobs is Rs. 8000/- per month and for Jr. Technical Assistant Jobs is Rs. 13,000/-. Please refer Sriganganagar District, Rajasthan official notification for more information regarding Sri Ganganagar District Jobs. Post Name: Accounts Assistant, Junior Technical Assistant. Total No of vacancies: 24 posts. Organization name: Collector Office and District Programme Coordinator, Sriganganagar. Total no of vacancies in Sriganganagar District Recruitment are 24 posts. 1. Junior Technical Assistant: 02 posts. 2. Accounts Assistant: 22 posts. Salary offered for Jr. Technical Assistant Jobs is Rs. 13000/- per month. Salary for Accounts Assistant jobs is Rs. 8000/- per month. For detailed information regarding pay scale please refer the official notification. Qualifications required for Accounts Assistant is B.Com/ C.A Intermediate I.P.C/ I.C.W.A from recognized board/ University. Qualifications required for Junior Technical Assistant is Diploma/ Degree in Civil/ Agricultural Engineering from recognized university. For more qualification information please check the notification. Age limit for the present recruitment vacancies is 21 years to 35 years as on 01-01-2017. Relaxations in age applicable as per Sriganganagar district organization norms. Candidates will be shortlisted based on merit in written Exam/ Interview/ Skill test/ document verification. Job seekers who are willing to apply for Sriganganagar district Recruitment jobs may go through the district website of Sri ganganagar @ www.sriganganagar.rajasthan.gov.in. Download the application for specific post from the Sriganganagar website. Download the notification and read the instructions before applying for these Accounts Assistant jobs. Fill the application form by entering all required details. Once the application process is completed, recheck the information. Last date for submission of Sriganganagar Dist Application form 30-08-2017 through post. Application Submission last date: 30-08-2017.